We are experts at lighting maintenance. LRS self performs 100% of our service work to ensure our team has the knowledge and training to bring value to our maintenance customers. When you partner with LRS you’re getting more than a one for one lamp swap. LRS works with each customer to understand your lighting goals and desires and we archive historic data to continuously analyze the best way to maximize performance and minimize outages. Maintenance services can be customized for your service needs. Utilizing our proven maintenance tracking software and maintenance team LRS helps you maximize your lighting investment. 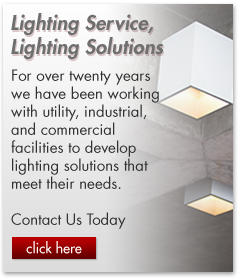 Our lighting maintenance is customized for your service needs. Our maintenance tracking software and maintenance team helps maximize your lighting investment.